Looks like OMGPOP, the company behind the overnight sensation Draw Something, will end up at Zynga, after all. The game maker had been talking to several suitors over the last few weeks. But as TechCrunch reported earlier, it has been in serious discussions with Mark Pincus and company for the past few days. Now Zynga has scheduled a call for a “news announcement” for 3 pm ET. I’m going to go out on a short limb and assume it’s to formally acknowledge that they have bought the company. My sources tell me the purchase price will be in the neighborhood of $200 million, perhaps a bit higher. The company had raised around $16 million over the past five years. No comment from Zynga. I haven’t heard back from OMGPOP CEO Dan Porter. Zynga will get a New York-based team of about 40 people, and a series of games that OMGPOP has produced over the past few years. 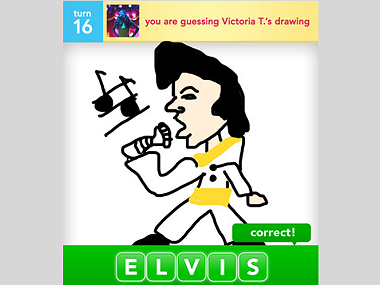 But the obvious target here is Draw Something, a sort-of social Pictionary game played on iPhones and Android handsets. The game is astonishingly popular, and the iPhone app sits atop the iTunes “top paid” and “top free” lists, which is very unusual. Even more unusual: It is also the top-grossing app at iTunes, based in large part on in-app purchases made by players. People familiar with the company tell me it has recently been netting around $250,000 a day from the game — that’s after Apple takes its 30 percent cut. Zynga is a Facebook games powerhouse, and has been steadily acquiring smaller companies with hits on their hands. Two years ago, it paid $53 million in cash and stock for Newtoy, the company behind Words With Friends. OMGPOP has played with Facebook games itself, but while Draw Something is Facebook’s “most popular” game, it’s not really a Facebook game at all. Intead, users log in with their Facebook credentials, but play the game on standalone apps. Draw Something’s astonishing success may have made it tempting for the OMGPOP folks and their backers to consider taking a large funding round and keep going on their own, a la Rovio and Angry Birds. On the other hand, just a few months ago, OMGPOP had been thinking about raising money under vastly different circumstances — “things did not look awesome,” says one investor — and then Draw Something hit, out of nowhere. “No one had any idea that this would take off, and no one knows why it did,” says another OMGPOP backer. Now no one has to figure it out — they’ve taken all the risk off the table.